The Secretary General of the Council of Europe, Thorbjørn Jagland, visited the Moscow office of the International Memorial society while he was in Moscow. As reported by Radio Svoboda, Jagland said that it was a "visit of support and solidarity". The head of the Council of Europe is concerned that the organisation may be closed as a result of the Ministry of Justice's court action, which the Supreme Court of Russia will continue hearing on 17th December. Jagland said that he came to Moscow in the hope that "the problem can be resolved". During his meeting with board members of the organisation, the Secretary General of the Council of Europe said Memorial was an outstanding organisation and stressed that repressive laws should never hamper the work of non-governmental organisations. 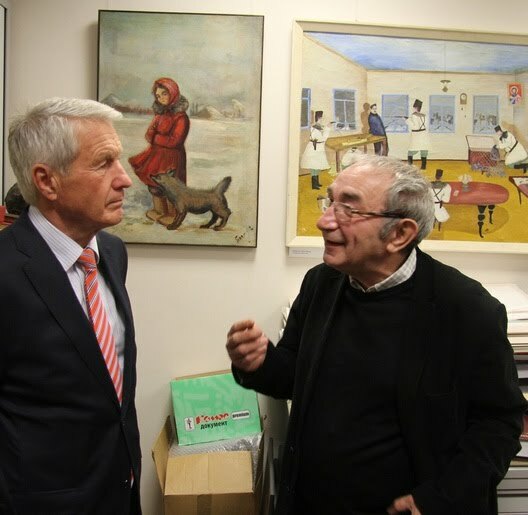 Thorbjørn Jagland's meeting with members of the board of the International Memorial Society was preceded by a tour of the offices of Memorial, given by Arseny Roginsky, chair of the board. He showed the Norwegian guest the Memorial museum and archives: moveable racks with vast quantities of unique documents, including, for example, Boris Sveshnikov's prison camp drawings and miniatures by Mikhail Sokolov (works of genius, according to Roginsky), and a group photo with some faces blanked out (so that if the photograph was found during a search it would be impossible to prove that the owner of the photo was in contact with "enemies of the people"). Mr Jagland also saw the "Right to correspondence" exhibition, due to open on 1st December. The exhibition is about a little known aspect of the repressive system of the Gulag, the deliberate control over political prisoners’ communications. Jagland was told the history behind some of the exhibits. 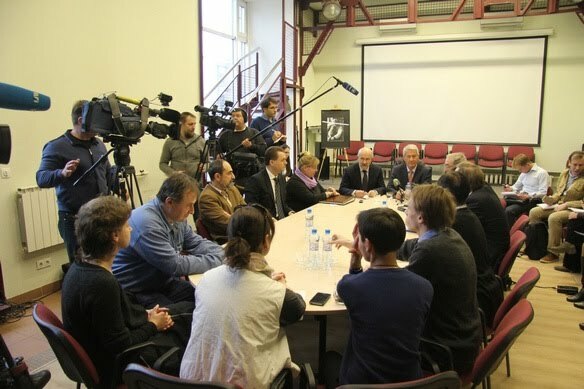 During the meeting with the board of International Memorial, he stressed that Memorial is an "outstanding organisation", that it is "very important for any country to live with its history" ("you help Russia to do this"), that "Memorial's activities are highly regarded in Europe and the world", and that repressive laws should never hamper the work of non-governmental organisations anywhere. "When I found out that Memorial might be closed down [ie. Russian Memorial (ed. )], I telephoned the Ministry of Justice of the Russian Federation immediately and said that we must jointly strive to avoid this happening", said Jagland. In his words, a negative evolution of the situation can be avoided, " and Memorial can continue its work": "Today I will raise this issue at a meeting at the Ministry of Justice". Arseny Roginsky thanked Thorbjørn Jagland for his support and reminded him that the Ministry of Justice objects to Russian Memorial on administrative grounds and, at the same time, one of the key Memorial organisations (the Memorial Human Rights Centre) was labelled a "foreign agent" in July 2014. Aleksandr Cherkasov, chair of Memorial Human Rights Centre, took up the same subject: prosecutors addressed their objections to the Human Rights Centre on 30th April 2013 on the 45th anniversary of the first issue of the ‘Chronicle of Current Events’, objecting to the fact that "we maintain lists of political prisoners and monitor politically motivated arrests, and arrests at public events": "In 1968, the ‘Chronicle’ did exactly the same and was persecuted for it. In other words, we are continuing our tradition, and prosecutors are continuing their usual activities". During the conversation, Arseny Roginsky noted "the complexity of the Russian tradition": "The government has difficulty understanding what society is, what NGOs are and what freedom of association is. I hope that ultimately the Constitution, international law and law in general will be victorious". He summed up the philosophy of Memorial for Thorbjørn Jagland: "The past and the present are one. We study mass violations of human rights - the Stalinist terror — which happened in the past. And when we work on violations of human rights today, we look at today using our understanding of the past". Roginsky also talked of his conviction that "Russia is part of Europe": "We have a common history, and the work of Memorial continually proves this central thesis. There is no other way for us than the European way. Human rights values are our common values". Jagland agreed that "Russia is part of Europe": as a member of the Council of Europe, Russia is committed to acting in accordance with the European Convention on Human Rights and Fundamental Freedoms. "A very important component of the European understanding of the role of the state is that the state should serve society, not the other way round", added the Secretary General of the Council of Europe. "Russia will change when people here understand that the state is our servant - we are not servants of the state. The aim of Memorial is to explain this to people", Arseny Roginsky replied. At the end of the meeting Roginsky gave Thorbjørn Jagland a copy of the catalogue of the Memorial Museum and expressed the hope that there would be enough time left for them to look at pictures and archive documents together in detail. Jagland wrote in the guest book for distinguished visitors and thanked Memorial for the informative visit.